Just a quick, Works in Progress post today. 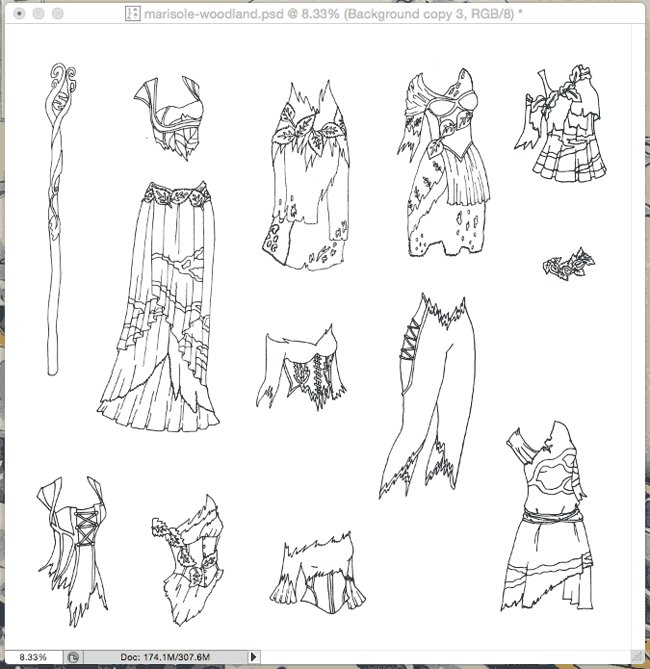 I have a whole list of paper dolls I am trying to get finished. Some are destined for the blog and some I hope to put up for sale eventually, once I get my act together. First up we have one of the Sprites. She’s a mermaid, but a modern one. I liked the idea of a modern mermaid girl with some contemporary beach clothing along with her tail. Plus any excuse to draw an aqua-blue afro. My little mermaid paper doll in progress. One of the requests from my Patrons (Join if you wanna) was to create some more fantasy gowns for the Ms. Mannequin series. So, here are some! I actually drew these back in December, but just now have gotten around to posting any pictures of them. I am still coloring. I haven’t really settled on a color scheme for these, so it’s been a struggle. 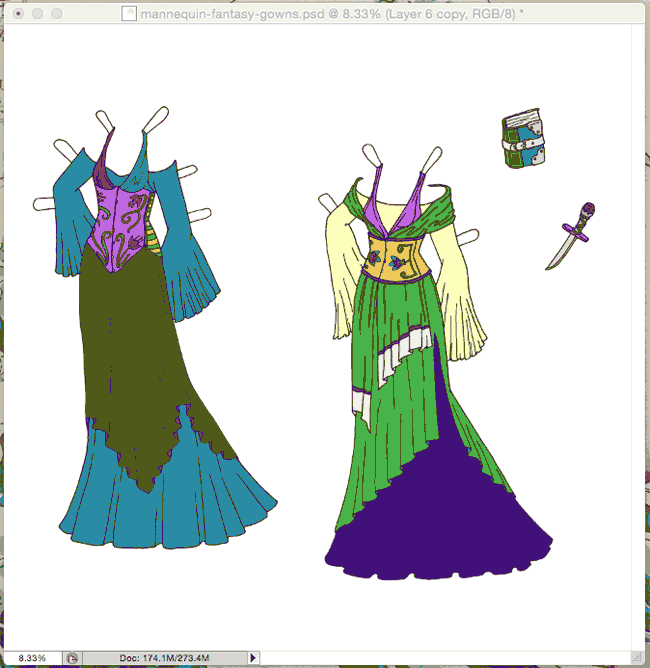 Some fantasy gowns for the Ms. Mannequin series. Third up is another Patron request which was “Woodland”. So, here’s my woodland fairy/fantasy set that I have been working on. I am thinking a green and autummal color scheme with lots of browns, greens, oranges, yellows and rusts. A woodland paper doll set for one of the Marisole Monday & Friend’s paper dolls. And that’s what I’ve been working on! Along with all this, I am also working on a series of videos about drawing paper dolls and am looking for questions about my process so I can answer them. I’ve gotten a great one so far, so anymore would be appreciated. Just leave them in the comments! Oh my goodness I LOVE the woodland set! An autummal color scheme would be perfect! The filter I use to color prefills all areas with color and then I color over that. So, I guess the answer is that some of those colors are colors I plan to use and some are just pre-fills that I haven’t filled over yet. Ok, thanks. I can’t wait to see all these sets out! Love the woodland one too!! The Little Mermaid Sprite is adorable!